A Boutonniere deformity of the finger is the result of an injury to the tendons that work to straighten the finger joints. Often people sustain this type of injury during sports or work and think they simply ​jammed their finger. However, over time, the Boutonniere deformity can progress, and even become a permanent problem. Fortunately, if diagnosed quickly, there are treatments that can be effective. 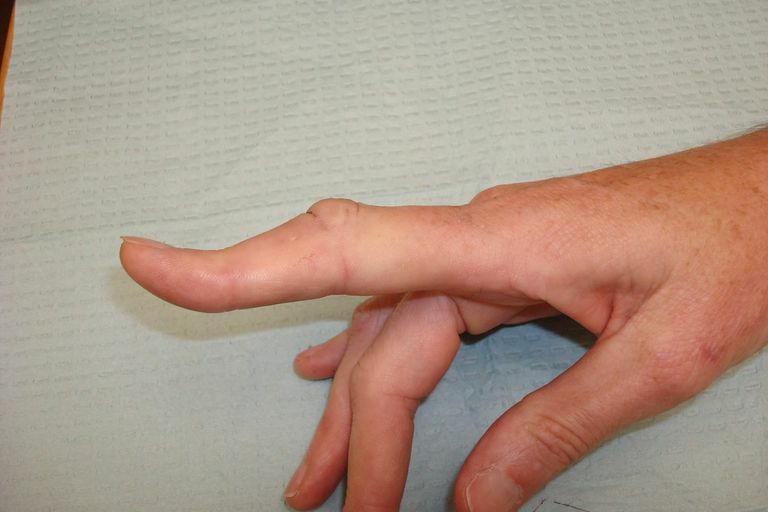 A Boutonniere deformity occurs after a very specific injury to the tendons of the finger. Your fingers bend back and forth by tendons pulling on the bones. The flexor tendons are on the palm side of the finger and pull the fingers down–a motion called finger flexion. The extensor tendons are on the back of the finger and work to straighten the finger, a motion called finger extension. Each finger has its own extensor tendon, and each extensor tendon attaches to the bone in several locations. The three bones of the finger are called the phalanges (each one is called a phalanx) and are named according to location. The distal phalanx is the tip of the finger, the middle phalanx is between the knuckles, and the proximal phalanx is the base of the finger. The extensor tendon attaches to both the middle phalanx and the distal phalanx. When the extensor attachment of the distal phalanx is injured, it is called a mallet finger. When the extensor tendon attachment of the middle phalanx is injured, the result is the Boutonniere deformity. The specific attachment of the extensor tendon on the middle phalanx is called the central slip--so technically, a Boutonniere deformity is caused by an injury to the central slip. The central slip is an important attachment of the extensor tendon. This part of the extensor tendon pulls on the middle phalanx causing the middle part of the finger to straighten. When the central slip is injured, the first knuckle (the PIP joint) cannot fully straighten and looks slightly bent at all times. However, that's just part of the Boutonniere deformity. Finger mechanics are very complicated, and when one part of the finger is damaged, other parts of the finger may not work normally. In the case of the Boutonniere deformity, because the PIP joint can't straighten, the ligaments on the outside of the finger are shifted in their position. Instead of working to bend the last knuckle (DIP joint) the ligaments begin to pull the last knuckle past straight (hyperextension). Therefore, the deformity of a Boutonniere finger is flexion of the PIP joint, with hyperextension of the DIP joint. Whew! Typically, a blunt force applied to the back of a bent finger is the cause of the Boutonniere deformity. As stated, this is often a sports or work injury. A sharp, penetrating injury such as a laceration, can also cause a Boutonniere deformity. Early recognition of this injury is important, as beginning treatment within a month of the injury is usually sufficient to allow non-surgical treatment to be effective. Treatment consists of splinting the PIP joint in a fully straight position for at least 4-6 weeks. Most often, acute injuries treated with splinting will resolve and fully heal. Injuries that have been around longer are less likely to improve with splinting, and may never return to normal. Surgical options to repair the tendon and reconstruct the ligament can be helpful. In addition, surgery may be recommended for some specific causes of Boutonniere deformities including penetrating injuries, rheumatoid arthritis, and Boutonniere deformities that occur along with other damage to the finger. Boyer MI and Gelberman RH. "Operative correction of swan-neck and boutonniere deformities in the rheumatoid hand" J Am Acad Orthop Surg March 1999; 7:92-100.